George Cressel was interviewed by Amy Rieger on September 8, 1993 in Park Rapids, Minnesota as part of the Itasca State Park Oral History Project. He summed up the benefits of his experience in the CCC as very worthwhile. GC: I felt that it was needed and I enjoyed it because it helped my dad and my grandmother and my uncle, and it was good for marriage. I think it was good for all the types of people that got in there. Boys off the street, boys like myself who were out of high school and their folks needed help and they were glad to go in and help them. I don't know what my family would have done if it hadn't been for me going in. My dad didn't find any real work until about the time I got out. He was working part-time for a company and did all the bid work because he knew the plumbing business inside and out, but it wasn't steady. He didn't have a steady job. I didn't begrudge it because my dad was good to me. I'd ride bicycles and that money I made at the golf course was mine and he never [unclear] when he was working or making good money. So I gave some of it for board and room, and I was old enough that I should have been paying because I was out of high school and we got $1.15 a round [of golf] for carrying and sometimes I'd go three or four rounds a day. A lot of families were living on that kind of money. So I was happy to help him out. AR: Overall would you say the CCC was a valuable experience? GC: Yes. It was a hard time...and for many years they didn't have that to do. To have that money coming in...some of them, their families saved their money for them. Most of them helped their family, and that in itself was valuable. Not only that, you learned how to get along with other people, it was a learning experience. I think it was. It was very worthwhile. Also the fact that they kept the boys out of streets of big cities like New York and Minneapolis/St. Paul and Duluth, any big area, I think was a valuable experience. The project was good. 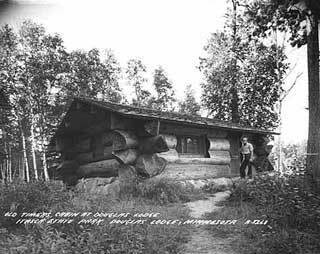 Cabin built by Civilian Conservation Corps, Itasca State Park, 1945. Cressel, George; Amy K. Reiger, Interviewer, Itasca State Park Oral History Project. MHS Oral History Collection, 1993.